A private jet vacation in China is an experience to remember. Hurtling into the future with one foot firmly rooted in the past, China is an incredible experience that will send you over the edge. For westerners, the sprawl of China is remarkably exotic from the sheer contemporaneity of Hong Kong to the lonely rice paddies and misty riverbanks of Guilin. China is a country that will leave you breathless as you tiptoe through the Forbidden City, admire the carved rice terraces, swim in the glacial lakes of the Jiuzhaigou Valley and wind your way along one of the seven world wonders – The Great Wall of China. Get ready for the adventure of a lifetime with Presidential Private Jet Vacations, curating the best in bespoke private jet tours so you can discover the delights of China. Whether you want to traverse the spiritual peaks of Mount Lu or soak up the luxuries of Shanghai, we can tailor the perfect tour, doused in beyond-first-class finery, rare experiences and authentic encounters. 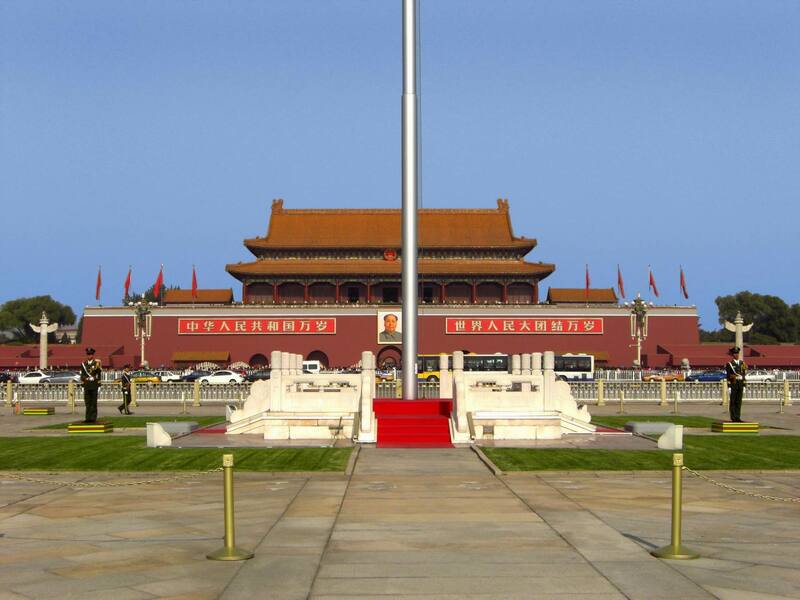 The capital city of China is brimming with old world beauty and modern grace, adorned with divine temples, sweet summer gardens, delightful lakes and a mouth-watering array of rickety food stalls in the streets of Beijing. The Forbidden City has finally opened its gates after five hundred years tempting guests in to wander the ornate interior buildings. Bow your head at the spiritually inspiring Temple of Heaven and meander along the famous spots of the imposing Great Wall. Soak up old world wonder in the labyrinth like Hutongs with their rickshaw tours, cozy courtyard houses and narrow alleyways. Climb aboard your private jet for a comfortable stay as you fly off towards Yuanyang. As you approach your destination, admire the epic landscape composed of rice terraces gently spread across the rolling fields. 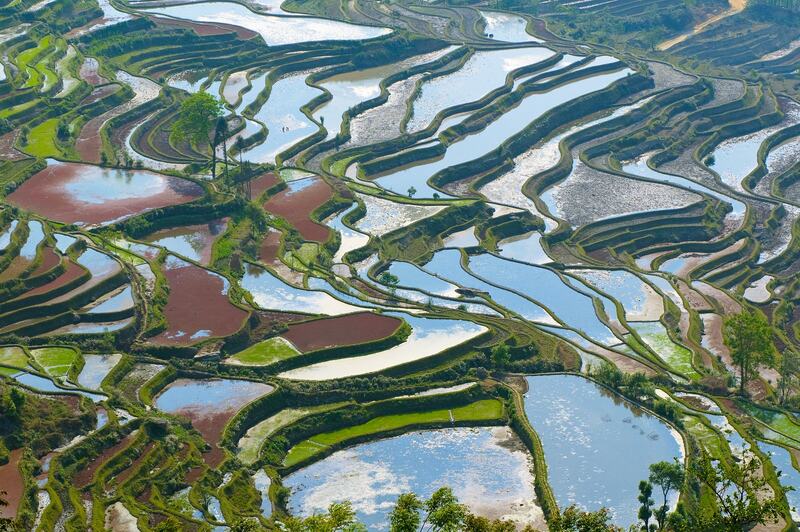 Over time the terraces have collected water creating a natural mirror reflecting the emerald green algae, the jade hills, the blushing pink sky and the dipping sun. The ethereal effect is truly mesmerizing and perfect for photo opportunities. Hike the terrace trails, visit the colorful local markets and discover the traditional way of life in the peace and breathtaking natural beauty of the rolling Chinese countryside. The ancient capital is a whirlwind of relics, old world wonder, pagodas, ruins and fabled stories steeped in history. The start of the Silk Road gives a rare glimpse into the trading world and the old city wall is a remarkable place to stroll and discover the fascinating delights of the city. 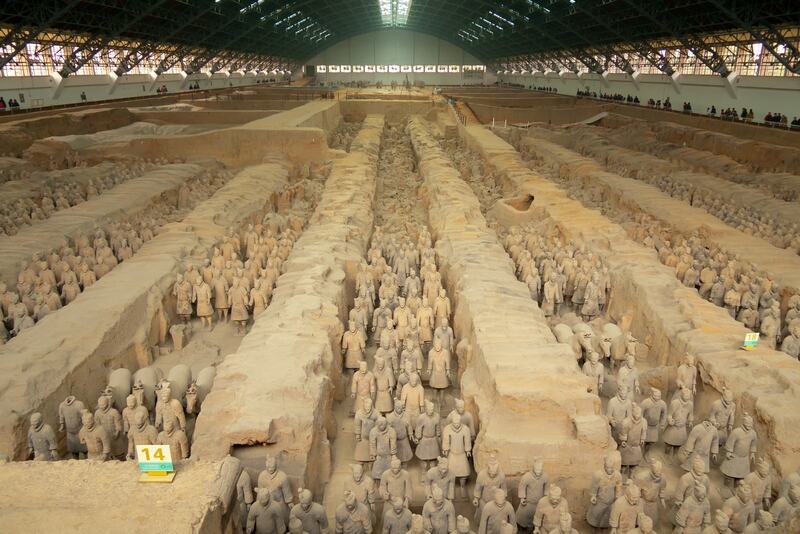 The Terracotta Army is perhaps the most famous site in the whole of Xi’an and tourists from across the globe flock to see the strength of the 7,000 soldiers, horses and chariots molded from terracotta and hidden underground for thousands of years. Dine on delicious dumplings as you lose yourself in the color and class of the Imperial Show, delivering a rare insight into the startling world of the Tang Dynasty. 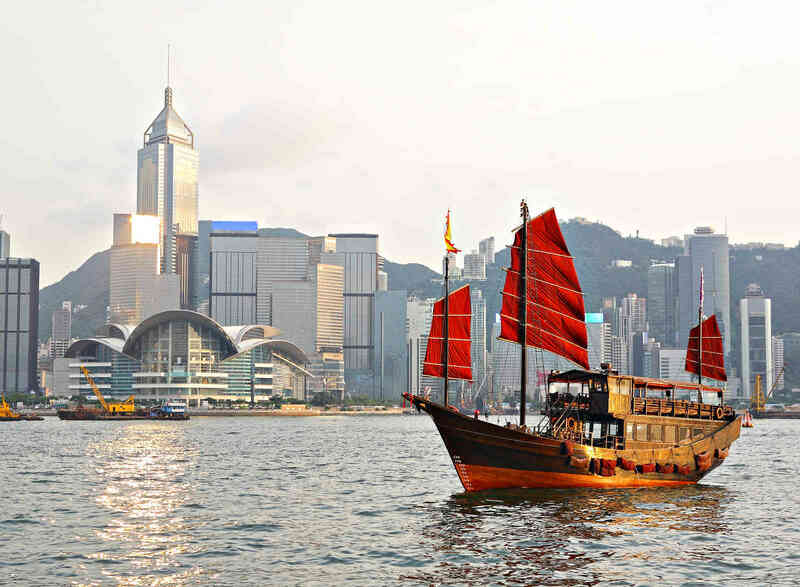 Hong Kong will sweep you off your feet from the first moment you step off your private jet; the emblematic city never fails to surprise with its glorious skyscrapers, modern intricacies and incredible food. The dynamic street markets are bursting at the seams, the sticky scent of Dim Sum permeates every corner and the thronging crowds’ stream through the bright city streets. Despite the fast pace of the city you can escape to the blue and silver beaches of Lantau Island, hike the forest trails and climb to the peak. Silk, tea, shimmering waters and reflection in every step will bring you one step closer to heaven on the shores of Hangzhou. West Lake is one of the most incredible spots with its hazy mountains rising to meet a yellowing sky, its deep calm waters and its snowy summits. 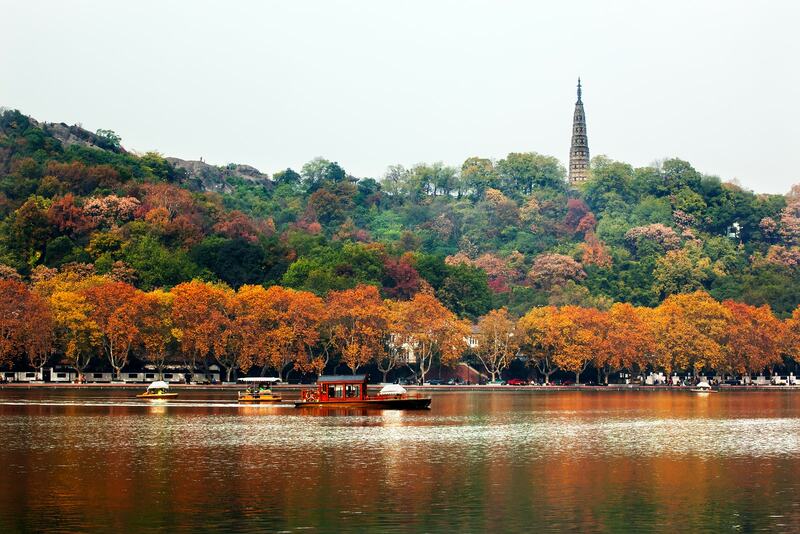 Water is the giver of life in Hangzhou and the towns drifting on the banks boast incredible architecture, ornately inspired bridges and incredible cuisine. Before climbing aboard your private jet for a peaceful flight back home, make sure to visit the silk museum to touch the reams of pure fabric, take part in a traditional tea ceremony and lose yourself in the bright and mystical gardens of heavenly Hangzhou.